Canon presents a sophisticated imageCHIP architecture facility in the digital multifunctional Canon imageRunner C2880. The Canon imageRunner C2880 comes slam-packed with full-featured color capabilities as a baseline for its quality performance. The multifunction digital printer's productivity revolves around the innovative technology that provides both compactness and convenience. The image server memory facilitates a standard 1 Giga Byte of Random Access Memory. The imaging device supports a maximum of 1.5 Giga Byte of Random Access Memory. The hard disk drive is 80 Giga Bytes, which is more than enough for medium-sized operations. The imaging device contains a scannning resolution of 600 x 600 dots per inch and printing resolution of 600 x 600 dots per inch, with an interpolated resolution of 1200 x 1200 dots per inch, and 256 Gradations of half-tone. The Canon imageRunner supports output of letter-sized documents between 28/26 pages per minute; The first-copy time will take an average of nine seconds for colored documents and an average of six seconds for black & white documents. 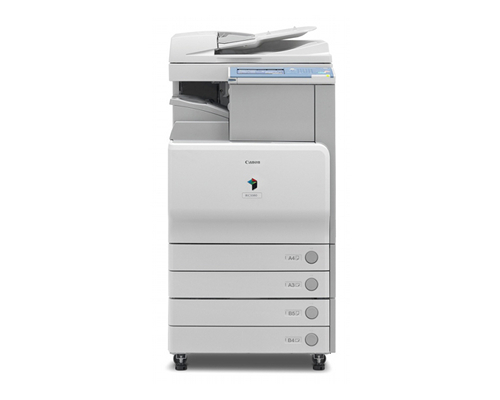 The digital device can handle up to 999 documents for print once and then many tasks. The magnification can be adjusted in increments of one from a minimum of 25% and a maximum of 400%. The preset reductions permit increments of 78%, 73%, 64%, 50%, and 25%. The preset enlargements are in increments from 400%, 200%, 129%, and 121%. The maximum original size applicable is 11 x 17 inches. The paper capacity is a standard-dual 550 sheets with 2 paper cassettes. The flexibility in the Canon imageRunner's paper capacity is apparent through its maximum capacity of 4,950 documents; Which is well beyond the requirements in enterprise environments. The fax board operates with a Super G3 board with multi-line capabilities. Public switched telephone network, one-line SuperG3, and two-line SuperG3 are connections utilized by the fax board. The capacity of the address book permits up to 1,800 addresses with 200 programmable one-touch buttons. Users have the option of utilizing File Transfer Protocol, Server Message Block, Network Control Program, and WebDAV for file formats. In e-mail/I-fax; Simple Mail Transfer Protocol, Post Office Protocol 3, and I-Fax are the formats used in communication protocol. The file formats used in the File or E-mail programs for the digital printer are TIFF, JPEG, and PDF; The PDF can be utilized in a variety of styles that also provide a level of protection. FTP (File Transfer Protocol) is the standard used for nodes communicating with each other over networks and the Internet. The SMB (Server Message Block) operates at the application-layer of the OSI model and is used primarily for shared access of network resources, printers, and serial ports. The POP3 (Post Office Protocol 3) is a new standard for clients and servers. POP3 is utilized by Internet Servers mostly. The Internet Server will maintain e-mails in the server for future downloads. Internet Explorer, Netscape, and Outlook Express can access the standard POP3. The mail will always be available for download as long as the server is operational. The I-Fax is an increasingly popular method of paperless faxing because no extra telephone line is needed. I-Fax is paperless, integrated with e-mail, and permits users to utilize the features anywhere there is Internet access. The I-Fax feature suggests the printer is compatible with VPN (Virtual Private Networks). The digital multifunction device main unit is 31 inches of width, 22 inches of depth, and 29 inches of height. In the DADF form, the size of the unit is slightly bigger than the main unit at 36 inches of width, 22 inches of depth, and 29 inches of height. When the stack bypass is extended, the size of the printer is 34 inches of width, 29 inches of height. However, the printer can be effective in enterprise business applications, but the sheer size of it is not ideal for small businesses or home offices. Overall, the printer weighs approximately 256 pounds, but varies in its weight depending on the optional add-ons; still, the printer is quite heavy to tug around when it needs to be moved. Canon explains the 1200 dots per inch option will slow down the engine; if users do not mind waiting a while longer for the quality 1200 x 1200 dots per inch documents, then it is tolerable but not ideal for faster enterprise business environments. The 20-30 something pages per minute generated by the digital imaging device is sub-par in speeds needed by some enterprise level businesses. 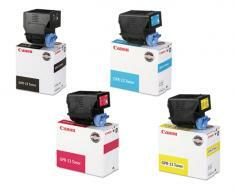 Review it: "Canon imageRUNNER C2880 "
The included toner, yield for black, is 26,000 images based on 5% coverage. For color, the yield is 14,000 images based on a 5% coverage. 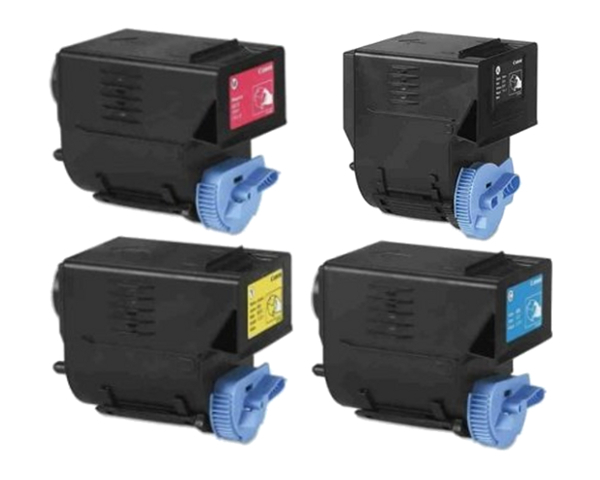 The genuine, original toner cartridge for Cyan color yields 14,000 pages, Magenta yields 14,000 pages, Yellow yields 14,000 pages, and Black yields 26,000 pages. The four colors of toner utilize drums for the imaging jobs; Each genuine drum color yields 60,000 pages. The yield varies according to the complexity of each print or copy task.